At Proscreens we had the pleasure of providing the Port of Dover with audio visual equipment hire services. 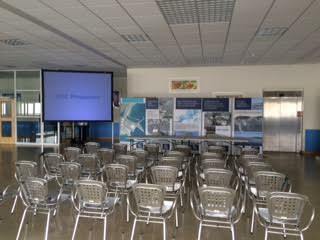 The Port of Dover asked us to supply a projector and screen for a small conference. This involved us getting there very early and setting up the A/V and screen equipment before an early morning conference. This is not the first time we have been in Kent supplying AV Hire and Screens equipment for hire. In Thanet we have supplied screens for film festivals and for a film shoot on location. We have also supplied audiovisual hire equipment speaker hire and screen hire for the NHS in Kent and general conference equipment such as TV screens projectors speakers and microphones.